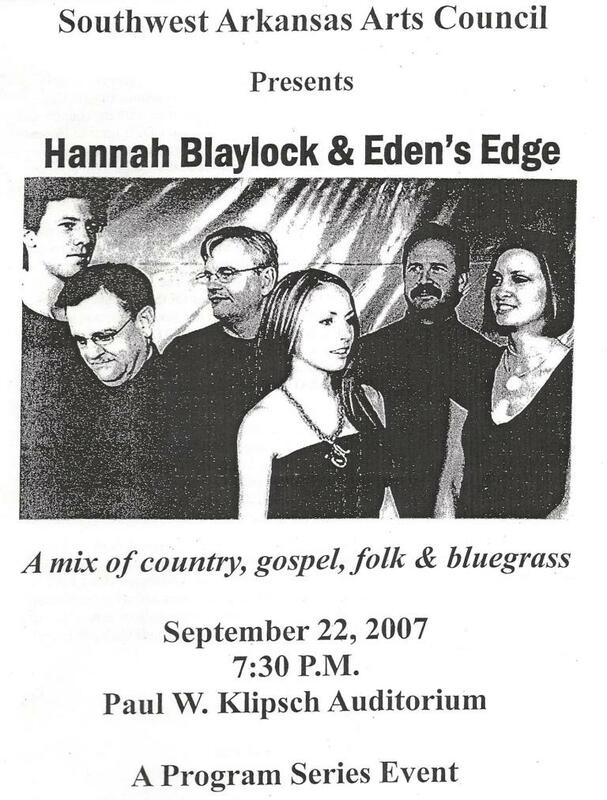 Back in 2007, I took my family to see Hannah Blaylock and Eden's Edge (how they were known back then). I had been following them for a couple years by that point, and the group was coming to Hope to perform one of their last concerts as HBEE (the shortcut for their band then). I'm not sure how, but the program for that night was sitting on my desk in the home office. I thought I would scan it in and share it. 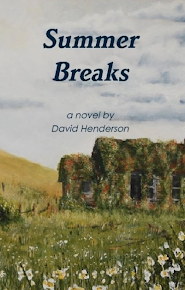 Well, okay, I am sharing the cover and the bio. 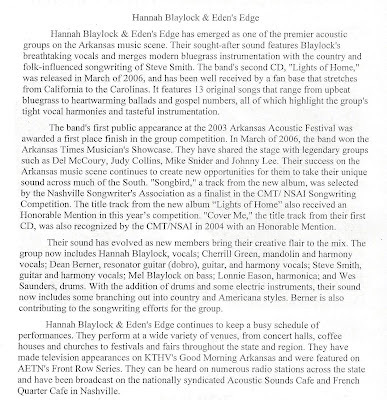 The rest of the program was actually a "thank you" list for the Southwest Arkansas Arts Council. I figured I would spare you that part. During the show, Hannah asked if there were any songs in particular the audience wanted hear. It was actually a planned thing so that she could sing with her mother on stage. I, not being smart enough to "get it" yelled out the title of one my all-time favorite HBEE songs: Jesus Saves. They graciously obliged. Frankly, I think they were surprised anyone would actually yell something out of the small (roughly 150-200 people) crowd. Of course, these days, Eden's Edge sits on the brink of mega stardom. Their debut major label album (EP, actually) includes hits such as "Amen," "Cherry Pie," and their amazing rendition of "Christ Alone." 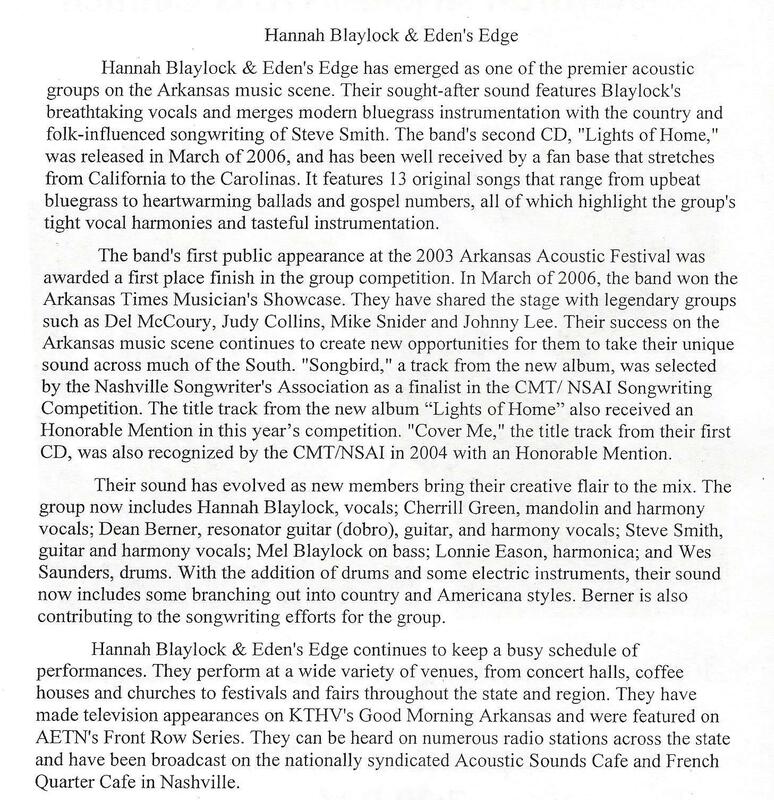 I wholeheartedly recommend looking up HBEE's previous works to get the full range and scope of what this talented trio from Arkansas can really do! If three apples were tied together and could produce sound only after being eaten, the string would be called a cored chord cord. If the King of the land decreed that horse tack should be launched at his subjects during the entire term of his rule, it would be the Rein Rain Reign. If a teenager was really bad at applying acne medicine, you could say he was a poor pore pour. And, of course, if you addressed several envelopes to multiple twins, they'd be To Two, Too. If a rich man could buy his dream vacation at the store, it would be found in the "I'll Isle" Aisle. Yeah, I'm on roll here folks: Naturally, a group of guys headed for a game of golf: Four For Fore! If Orville and Wilbur always took notes on their success and never their failures, it would be a Right Wright write rite... or even a Wright right write rite.... Heck, even a Write right Wright rite. Or if you asked them about it: Wright write rite, right? If a beaver chomped down on a live data connection near the bend in the road, it would be a bight byte bite! A particular method to measure the weight of Miss Tuffett's preferred treat is the Whey Weigh Way. YooHoo Mix-ins - Don't. Even. Go. There. YUCK! Let me start by saying I love Yoohoo. Not the strawberry junk. The original chocolate flavor. It's been a favorite of mine since I was a kid. Yoohoo came up with "Singles to Go." I bought some. The premise is that you pour the powder into 8oz of milk, stir or shake it up and POW, instant Yoohoo. Not. Even. Close. The powder does not fully dissolve. The taste is something that wants to be Yoohoo, but comes out like a bad batch of the good stuff. I don't know what happened between the bottled stuff and the powdered mix, but whatever it is, the magic disappears.